High school student wins a special day with Bondi Vet stars! Top Dogs - Who will be the most beautiful of them all? One lucky Campgoer to have Morning Tea with Bondi Vet stars! Unemployed youth put their best foot forward working with pets. Add Pet News to YOUR site! Australian & International Pet Transport for dogs, cats, birds, reptiles, aquarium fish, miniature horses, ponies & goats & other animals. Look in The Pet Directory for all your pets needs. Suppliers of pet products and services for your dog, cat, bird, aquarium fish, guinea pigs, rabbits, mice & horses. The Pet Directory is known as the "Who's Who" of the Pet Industry. 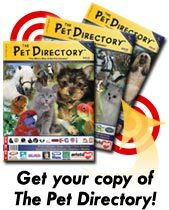 The Pet Directory is a print and web publication. We provide a directory of pet related products and services for the pet industry and the pet owning public. We offer Free pet products and samples from pet companies. Dog, cat, bird, fish, small animals such as guinea pigs, rats and mice, rabbits, ferrets and hamsters, farm animals such as chickens, miniature goats, alpacas, llamas, and sheep, reptiles, hermit crabs, lizards, snakes, wildlife and more. The Pet Directory lists breeders, dog and cat boarding, dog walking and pet minding, veterinarians, dog, cat, bird and horse trainers, dog walkers, pet friendly accommodation, dog off leash areas, pet shops and aquarium shops, dog groomers, dog grooming equipment, dog grooming courses and other pet related courses. The Pet Directory promotes dog grooming to the general public supporting dog groomers to display dogs being groomed, clipped, washed, coloured with colour dyes for dogs. Click to see photos and a report on the PIAA & THE PET DIRECTORY Victorian Grooming Competition. The dog grooming events are supported by the Dog Grooming Industry with grooming supplies companies products such as Troy Shampoos & Conditioners for dogs and cats. At these dog grooming competitions and displays, professional groomers answer questions about dog grooming and demonstrate dog grooming techniques, dog nail clipping, trimming, painting, dog colour dyes doing ears, tails, and colour tips, how to clip, how to brush various types of dog coats from poodles, maltese, shih tzu, terriers and other breeds. Grooming tools, brushes, combs, blow dryers, strippers, clippers are also displayed and their use demonstrated. Dogs are groomed on professional grooming tables with a team of groomers offering tips and advice on grooming your dog. They show basic grooming skills and advanced dog grooming techniques. Cat grooming displays are also planned. In The Pet Directory you will find cat and dog boarding and minding as well as pet sitting, dog walking and house sitting companies in VIC, NSW, QLD, WA, SA, NT, NORTH QLD, TASMANIA and regional areas. Click on the PET FINDA above to locate a cat or dog, bird, rabbit, guinea pig or other small pet minder. You will also find horse and farm sitters. The Pet Directory sells advertising to the pet industry in Australia, the U.S. and other countries. Advertisers include breeders of dog, cat, bird, fish, small animals such as guinea pigs, rats and mice, rabbits, ferrets and hamsters, farm animals such as chickens, miniature goats, alpacas, llamas, and sheep, reptiles, hermit crabs, lizards, snakes. The Pet Directory provides 'add ons' for their advertisers such as low cost professional websites, business cards, stationery and technical support for their websites. The Pet Directory offers Pet Product Competitions. Enter a pet competition to win prizes: dog prizes cat prizes bird prizes reptile prizes horse prizes aquarium fish prizes guinea pig cavy prizes rat pet competitions mouse prizes competitions galore pet lovers win pet prizes animal toys food medications accessories to win prizes for dogs, cats, cockatiels, galahs, lorikeets, parrots, miniature horses, poultry, fowl, puppies, kittens, prizes galore! Visit The Rabbit Rescue Sanctuary to view rabbits for adoption. Read Dr Harry’s heart-warming article on how pets enrich our lives. *There are currently 461 people online.